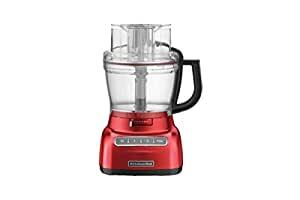 Featuring the revolutionary ExactSlice system, the KitchenAid KFP1333 Food Processor allows you to easily switch from thick to thin and small to large slicing. Externally adjustable slicing control Heavy, slip-resistant base Two speeds and Pulse provide precise control 3-in-1 feed tube accommodates large items Perfect for making pies, pizzas, cakes and desserts The KitchenAid KFP1333 Food Processor is robust and powerful enough to use every day, with the flexibility to help you create a range of wonderful dishes, from perfect pies and pizzas, to the most delicate of cakes and desserts. Exclusive ExactSlice system The ExactSlice system is the first ever externally adjustable slicer. Easily adjust from thin to thick (1mm to 6mm) slicing by simply sliding the lever from left to right. Ultra wide mouth 3-in-1 feed tube Adjusts to three different widths for processing foods of all sizes and provides more options for slicing variations. Round carrots for a salad or horizontal slices for the grill! Optimised speeds for better results Uniquely designed blade and two speeds give precise slicing and accuracy. Slice, shred, knead, chop and puree almost any food.